Family run characterful beach villa, with its own delightful terrace, garden and swimming pool, and just a short walk to the beach. The accommodation includeds a dish-machine, electrecity,gas and water. There is a spacious and light lounge/dining room with many local features including an open fireplace. An added attraction is a roof terrace with magnificent views. A fifteen minute walk gets you to Port de Pollença and a five minute drive to Pollensa. Bus stop is nearby too just 200meters away from the Villa. And also kite surf, and paddle surf . Visit all the year round: Pollença has long been known as an idyllic summer destination with its long hot days and balmy nights. Food and wine: There is excellent pork and lamb on the island, also an abundant supply of fish and interesting vegetables. Treats to relish could be a lunch of 'coca' - a kind of spinach and onion pizza - with some local grimalt cheese. For meat lovers try 'lechona' - roast suckling pig. Much investment has gone into local wines over the last years, and there are now many excellent ones to try. Pollensa town and port: An ideal base in the north of Malorca, whether you want an active or restful holiday. Port de Pollença is a refined resort with its beautiful crystal waters and sandy beaches against a backdrop of magnificent mountains. All water sports are available, and much more. Pollensa is a cosmopolitan and elegant town with old world charm, set in mountain countryside. We have renovated the full bathroom in 2014. The small bathroom has been reformed in 2016. Private parking zone and garage. Bath, pool and kitchen towels included. You should bring beach towels. The pool measures 7m x 4m. The minimum depth is 1 metre, and the maximum is 2 metres. We've just returned from a fantastic holiday at this wonderful villa. The pool is a good size to cool down and swim in, the garden is big enough to easily find a place in the sun or the shade, (as you wish,) the patio area is big enough to easily sit 6 people around the table (unlike some other villas we've been at), and there are 2 fridge/freezers, a washing machine, a dishwasher and a BBQ - all that we usually wish for. The ants were kept to a minimum by judicious use of a spray, and we fixed our own mosquito net to the bedroom window so could sleep with the window wide open at night. (There is a mosquito screen on each window, but it is quite old, and there are the occasional gaps in it, and tape in places holding it on.) Again this didn't bother us. It is a comfortable rather than luxurious villa and the double bed and pillows we had were among the most comfortable of all villas we've stayed at. We spent one night in the main twin room, when we had ants in the middle of the night, and those beds didn't seem so comfy, but we still managed to sleep! 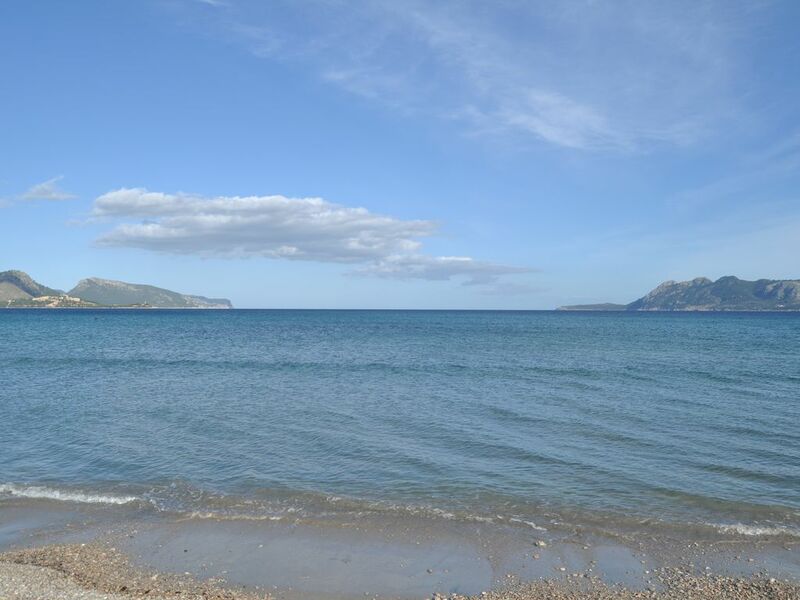 The sea is one minute walk across the main road - sandy bay, and there are numerous little coves and bays for snorkelling within a 15 minute drive. There is entertainment on your doorstep if you wish, at the aparthotel in front. Noise wasn't a problem - yes there was the occasional screaming child at play, but it was only during the day. and the children's evening entertainment finished early. All in all I thoroughly recommend this villa and will definitely be booking again. Thank you Maria, Pepe and Joana for letting us stay there. See you soon! after many years of renting villas around spain and the Algarve 4 previous in porto pollenca, we took this house for a week in august as it looked private and was priced very good for mid august high season. private it was but yet within a 4min walk to a draught pint at 2 different bars a bit of entertainment in the club sol at night was there if you didn't want to drive to town or just stay by your own pool and enjoy the peace and privacy. everything was supplied down to the coolbox for the beach which we took to the aquapark. owners very very tuned into taking care of there clients and offered any help you may need and were genuine about it. house very clean and easy to keep that way. but you cant put a price on the peace and quiet with no need to fight or reserve sunbeds now that's a holiday. Couldn't have been more happy with our stay at this villa, owners were extremely welcoming and the property has everything you could ever want on holiday. Easy access to many places from the bus stop right outside, Wifi also available from the nearby hotel. Also, it's easy to get a taxi to the villa by just naming the hotel nearby as all the local drivers know it. To anyone looking for somewhere to stay in this area you will not be disappointed with this villa, especially for the price! Thank you to the owners for a wonderful holiday. We have just returned from 2 wonderful weeks in this very pretty villa. A party of 6 adults and 1 toddler. Owners very warm and friendly,on arrival we were left a large delicious Spanish omelet, salad, fruit, and wine. The house was very clean and comfortable, garden and pool were great. The villa feels very safe and private, but only 2 minute walk to a very nice little bar restaurant,shop for essentials, bus stop, and sea .We would definitely like to rent this villa in the future . A big thank you to Maria, Joana , and Pepe for such wonderful holiday. We are really happy that you enjoyed your holidays so much. It was really nice having you in our villa as well. We look forward to meeting you in Mallorca again! Pollensa is delightfully unspoilt and Puerto Pollensa nestles in its beautiful bay.